With views over Bossington, this room also features free Wi-Fi, a flat-screen TV and an en-suite walk-in shower. Bathrobes and tea/coffee/hot chocolate making facilities are also provided. Access to a baby monitor and a cot suitable for a 2 years and under can be provided on request and are subject to availability. These rooms feature free WiFi, a flat-screen TV and an en-suite walk-in shower. The rooms have views across Bossington and Crawter Hill. With views across Crawter Hill, this room also features free Wi-Fi, a flat-screen TV and access to private external bathroom. Bathrobes and tea/coffee/hot chocolate making facilities are also provided. Access to a baby monitor and a cot suitable for a 2 years and under can be provided on request and are subject to availability. This room features free Wi-Fi, a flat-screen TV and access to private external bathroom. Bathrobes and tea/coffee/hot chocolate making facilities are also provided. Access to a baby monitor and a cot suitable for a 2 years and under can be provided on request and are subject to availability. This room has free WiFi, a flat-screen TV with DVD player, a modern en-suite walk-in shower, and a view of Bossington and Crawter Hills. Offering stunning views over the rolling hills of Exmoor National Park, in the Somerset village of Porlock, Exmoor Country House guest house is a Georgian-style property set in its own private gardens. 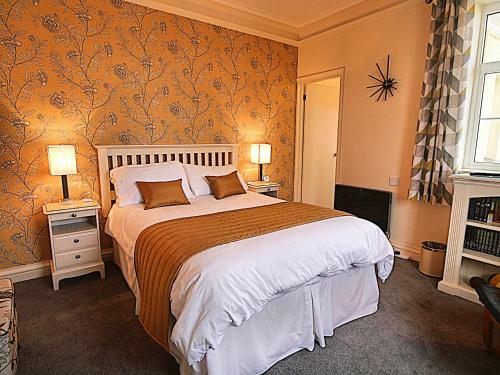 It offers high-quality bed and breakfast with free ample parking and free WiFi, and is just 1 mile from the coast. Each elegantly furnished room has en suite or private bathroom facilities with walk-in shower and complementary toiletries. There is a flat-screen TV, hairdryer and tea and coffee facilities in all rooms. A cooked or continental breakfast is served each morning at Exmoor Country House, using fine local produce where possible. Evening dinner is available to pre-order every day except Sunday. The onsite bar is available in the fully licenced guest lounge every evening from 18:30 until 23:00. The pretty village of Porlock has a number of small shops, cafes and pubs, and two local museums. Dunster Castle, near Minehead, is a 15-minute drive away and West Somerset Steam Railway is 6.4 miles away. Pets are allowed by prior arrangement in the clean, dry, safe and secure external enclosure. Please contact the property for more details, using the details found on the Booking Confirmation. Please note check-in is between 16:00–20:00. Lunch is not available at this property. Please include your full address, including your postcode, when making a booking. Different policies and additional supplements will apply when booking 2 rooms or more. Booker will be required to sign an additional acceptance form prior to arrival. Very friendly and warm welcome. Excellent find for exploring Exmoor. Steve and Sally gave us a very friendly and warm welcome. The rooms were very fresh and well maintained, and the breakfast was just the best. Wifi coverage in the bedrooms could be better. Very welcoming place to stay, with all the details right - fresh milk even for coffee in rooms, deep comfortable beds, good showers. Excellent selection of beer and gins at the honesty bar in the lounge. Great fresh cooked breakfast. It is a little outside Porlock, about 10 minutes to walk in. Everything about it. Happy to stay in such warm and helpfull place. There was answer for any question. Great place to stay for a couple. Brekfast one of the best I have had in hotel. Thank you Steve. Location , comfort, nothing too much trouble for staff. Fabulous experience. The House and grounds are beautiful. Steve and Sally are very friendly and helpful. Food is both delicious and filling. Bed is very comfortable. Room is private. House location is wonderful, easy to get around and a short walk to the village. Charming!! Quiet, nicely furnished and spotless rooms. Comfy bed and nice view across garden. Steve and Sally are very friendly and helpful . The breakfast is superb, as was the evening meal. Every effort was made to supply us with gluten and dairy free food - not an easy task! Can't think of anything we didn't like -all so well thought out and catered for. Von allen Unterkünften, in denen wir je zu Gast waren, was das die schönste, gepflegteste, geschmackvollste. Wir wurden sehr freundlich aufgenommen, es war wirklich ein ganz besonderer Aufenthalt für uns. Dear Sally and Steve, thank you very much for three wonderful days ! The warmth of the welcome by Steve; shown our room & immediately made to feel at home. Lovely lounge with 'honesty bar' and a wide variety of drinks on offer. Excellent breakfast plus the option of Dinner which was most welcome & worthy of a first class restaurant. A totally relaxing few days. Thank you ,everything was lovely . great nights stay, will definately stay again one day. Friendly welcoming and sociable hosts, lovely building and grounds, great lounge area with honesty box for drinks (great idea!). Excellent breakfast. Our bathroom was private but separate from our room, only 3 meters from our bedroom door, this wasn't a problem for us. Really enjoyed our stay and would definitely stay again. n/a. everything was really good. The welcome feel you got from the moment you arrived. There was nothing to dislike at all..
Best breakfast ever ☺️ Perfekte Gastfreundschaft, Abendessen war hervorragend und die Idee der honesty bar super! Wir haben uns sehr, sehr wohl gefühlt und kommen bestimmt wieder! The place was very elegantly appointed with classy furniture. We received a very warm welcome and liked everything. The shower cubicle could have been a little bit more spacious. Owners were lovely, very warm welcome. The room was beautiful with stunning outlook over the hills. To top it off the breakfast was delicious! Overall, amazing and would definitely visit again. Great hosts, very welcoming. In an excellent location. Lovely traditional house with contemporary twist. Had a really nice twin aspect room overlooking the garden. Dinner was tasty and breakfast, best bacon ever. Cant recommend enough. No mention on your site of evening meal possibilities which need to be booked in morning of each day. We stayed one night so had no opportunity to book. Beautifully kept hotel in a great setting. The food was delicious and everything about the hotel showed great attention to detail. It is lovingly maintained by the owners. 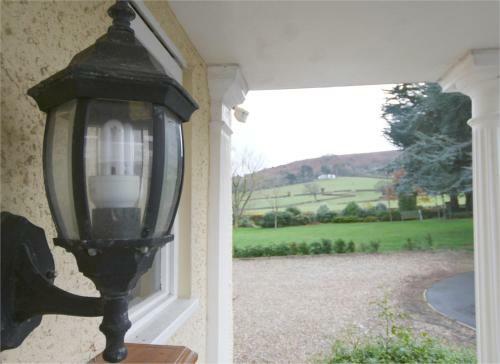 It is set in a lovely garden with views of the hills. The ensuite bathroom with double shower gave a feeling of luxury. There was a selection of DVDs in the room to watch in the evenings. The drinks tray included kitkats and mints as well as ordinary biscuits. Warm welcome from Steve and Sally. Fantastic room with view over the lovely garden and very cosy main rooms with a well stocked Honesty Bar..... Meal and breakfasts were beautifully cooked and the choice was varied and mainly locally sourced. Great stay and would definately return again.